I was stationed at Pearl Harbor (Honolulu) for a couple of years. Worked on Ford Island, in the middle of the harbor. Hawaii was, for me, the first place away from Connecticut (where I grew up) that felt like home. I'd lived other places (Florida, Maine, Illinois, Idaho), but never long enough for those places to become home. I remember the moment well. It happened suddenly. 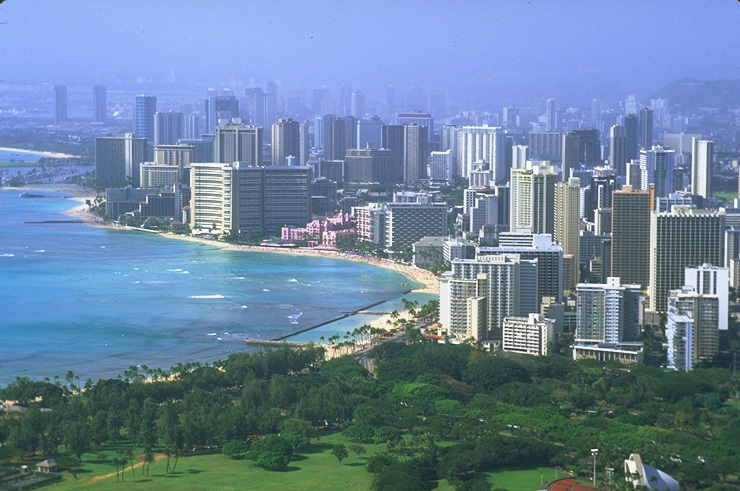 While walking down Ala Wai Blvd (in Waikiki), fast as you snapped your fingers, it hit me: Hawaii suddenly became my home. The experience surprised me. And in that instant, Connecticut became some far, foreign, obscure, tiny place. Those roots were uprooted. I enjoyed that cranial reorientation, cuz Hawaii is a great place to call home. At least, back then it was ('80's). The Dog has since returned and sadly called it seedy. One of the most lasting memories came after a 3-month tour at sea. We (entire ship's crew) had left Guam ("Where America's Day Begins") the previous day (Sunday) at 6PM, flew all night for 12 hours and landed at Honolulu International at 6AM. Because we'd crossed the International Date Line, we got to live over the SAME DAY (July 29th, middle of summer) .. a very cool mind-warp .. the closest thing to time travel we're likely to experience. Six months earlier, my shipmates took this same flight on New Year's day, and were able to celebrate the same New Year *twice*. But I reported aboard a few months too late for that. Anyway, being early Sunday morning, most Hawaiians were still in bed. Roads were empty. Hawaii's roads are rarely empty, so it added to the surreal atmosphere. From the airport, we took a taxi to a Waikiki. The driver was a big Samoan, probably 400 pounds. The Dog & Courtland (a responsible older guy whose job it was to keep us youngsters out of trouble) took the back seat, leaving the front for me. Nobody said a word. It surprised me nobody was talking, especially these guys, but I couldn't say a word either. After 3 months on a nuclear submarine (stainless steel pipes and Navy-green paint .. where everything is un-natural, including the lighting), you experience sensory deprivation. By contrast, Hawaii seemed hypnotically beautiful. Like in a trance, I felt numb yet hyper-alert, taking in all the natural beauty. As the Samoan drove that taxi down Ala Moana blvd, the sun began to rise over Diamond Head. It flickered thru the trees that line Ala Moana park .. hypnotizing me. A few joggers were out for an early-morning run. They seemed to flicker-by in slow motion. Like a strobe-light, everything moved in slow motion. A song came on the radio (turned down low): FM by Steely Dan .. a nice, slow groove, with the refrain No static at All ..
"Can you turn that up a little?" I asked quietly, like in church .. cuz that's how life felt at that moment:> No static at all. We'd just finished 3 months at sea (underwater, which felt like 3 years), and now we had 3 months of R&R coming, with pockets full of cash (cuz you can't buy anything at sea). Could be compared to being buried alive, then resurrected to this gorgeous tropical paradise. We rode the rest of the way without saying another word, listening to that song, staring out the window, overwhelmed by the natural beauty, with another chance to live over the same day. Only *this* day was gonna be a whole lot better than the last one. The Dog still talks about that taxi ride. I sent him a note saying, "Happy Pearl Harbor day." He wrote back, "No static at all." Like your first love (after mom), Hawaii holds a special place for me as that first home-away-from-home. Memories still bring a sigh of nostalgia. After hearing how run-down it's become tho, I don't think I could return. I don't want to ruin those memories. Anyway, here's remembering a day that continues to live in infamy, and other famous days that refuse to die.